The UK’s voluntary, community, and social enterprise (VCSE) sector spends around £40bn (NCVO UK Civil Society Almanac – https://data.ncvo.org.uk) on delivering services to some of the UK’s most marginalised communities and individuals. Like their counterparts in the global development sector, organisations in the UK voluntary sector face challenges in understanding their contribution to change and the lasting impact of their work; social change is complex and non-linear, so how can we judge what it is that drives identifiable change in particular circumstances? The ‘attribution challenge’ hits smallest organisations the hardest, those who are also under the most pressure to prove their worth in the context of funding reductions. A standard QuIP study interviewed respondents at a household level, asking them about changes, and drivers of those changes. In this case the ‘respondents’ to the qualitative interviews were organisations supported by Voscur, reporting on what had changed within and outside the organisation, and what they felt had contributed to that change. Whilst the trial was not conducted entirely blindfolded, the interviews were open-ended and exploratory – pitched as a ‘state of the sector’ evaluation. 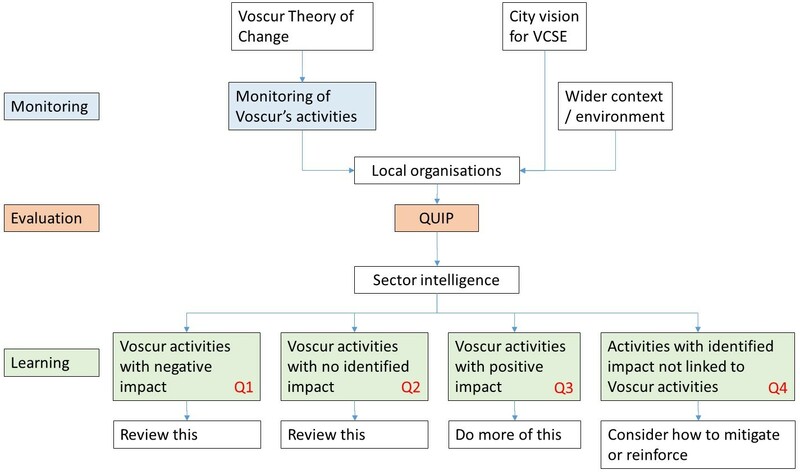 Voscur was able to understand and separate their contribution to change from other ‘actors’ in the sector in Bristol i.e. consultants, Bristol City Council, funders, etc. We’d like to engage with UK VCSE organisations to find out how they think we can address some of these issues, and particularly from those providing services to individuals who may be interested in running further trials with BSDR. The trial was also featured in a report (Using QuIP to gauge success in complex contexts – June 2017) written by Marlies Morsink, who is studying a Master of Research in Social Policy at the University of Bath. For more information please contact Ed Howarth, QuIP Project Manager on ed@bathsdr.org.